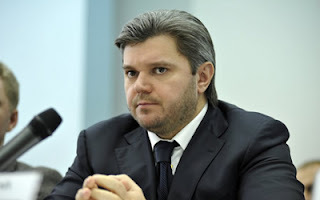 KIEV, Ukraine -- From May 15, 2013 Ukraine will receive European gas via one more reverse route via Slovakia, Ukrainian Energy and Coal Industry Minister Eduard Stavytsky has said. “I asked support from European Commissioner [Gunther Oettinger] to open a new reserve corridor via the territory of Slovakia." "On May 15 the test mode will be launched and test data exchange on the new reverse route from Ukraine to Ukraine and from Ukraine to EU will be conducted,” the minister said on Thursday in Brussels at a press conference held during the two-day international high level roundtable on the Ukrainian gas market. He added that Ukraine is waiting for the realization of the first phase of modernization of the Ukrainian gas transport system (GTS). “The sum is $550 million, including $240 million of national joint-stock company Naftogaz Ukrainy’s funds and $310 million of funds of international financial institutions,” Stavytsky said. The minister also said that Ukraine is waiting for new projects – signing of new agreements. “The first one we signed in January with Shell and now no more than in two months another two contracts with Chevron and a pool of companies headed by ExxonMobil will be signed. The actions are aimed at provision of the domestic market with gas,” the Ukrainian minister said.